... sounds very good for testing with the design - what's the price for all needed parts? On the other side, if it should be a straightforward reprap, then it should be able to do this work too! Maybe with a LOM-(Laminated-Object-Modelling)-building approach, where i stack sheets of self-adhesive (or glued together) paper or other material, and with a 'high-power'-cutting-laserdiode from an outweared DVD-writer (or simple a cutting pin-knife) it could be done in the reprap on his own? WOW! That is really awesome guys. Please keep us updated with your progress. I love the ingenuity in creating those lasercut parts. I seriously can't wait for the day when we release RepRap Laser Cutter Head v1.0. That will be sick! Does "pigtailed" refer to the optical fiber attached or to the wires? What is the frequency of the laser? What eye protection do you use while doing these experiments? 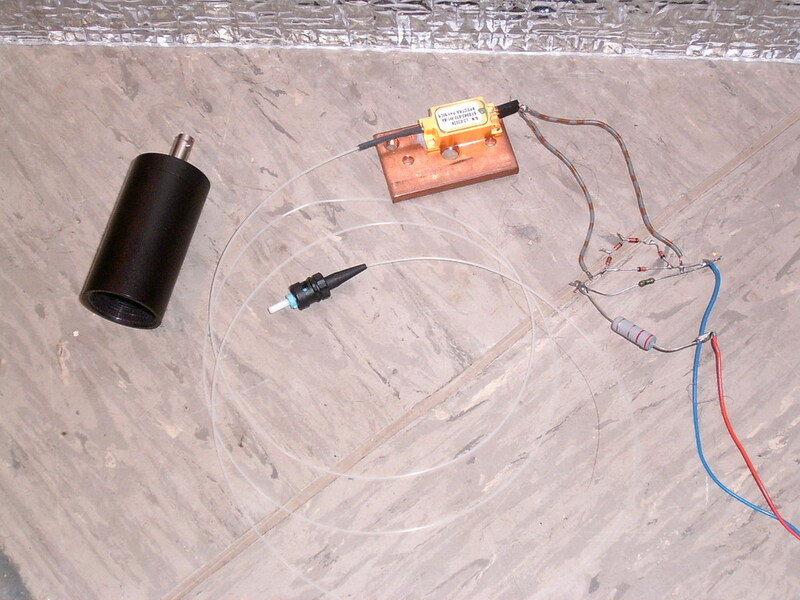 ... pigtailed means, that a fiber comes out of the laser-housing. A laser-diode is mostly a bar of active material (sometimes many aligned bars) with a very poor optical output-quality - the laser-diode emits a conical 'plane' of light, instead of a sharp laser-beam, as in a gas- or solid-lasers with the much longer and better resonators. With a special cylindrical lens there is a good part of the light-output focussed into the fiber. For experiments (and working too!) with high-power-diode-lasers i need the right goggle - here i use an IR-resistant 'laser-goggle' with maximum absorption at 750-1100 nm wavelength. It's essential, to protect your eyes and skin! With the here used powers a short blink in your eye can blind you for ever and a focussed beam cut in microseconds through the skin !!! If someone would use hp-lasers in the reprap, then he have to apply a protective housing and perimeter-switches, to stop the laser, if the housing is opened. The parts were cut from 3.6 mm ply on an Epilog lasercutter in the MAGICbox lab (UEL), the parts fitted on to 2 & 1/2 sheets of A2 and took about 4.5 hours to cut (a not the most efficient file). My guess is that they would set you back about 400 quid at a commercial place. I'll post the DXF CAD files once I've successfully tested one. We may do a few sheets for free/barter in kind for seriously interested folks.